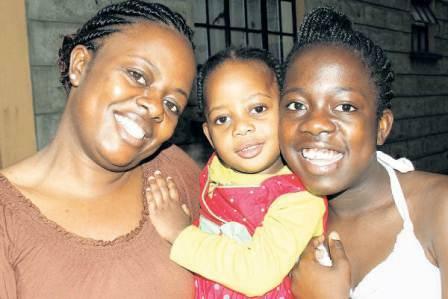 I met 35 year-old Lucy Ongaya and her two beautiful daughters Ruth and Chelsea two weeks ago. While her pregnancy with Ruth, now 13 years old had been relatively smooth, she had a life-changing experience with her second pregnancy. 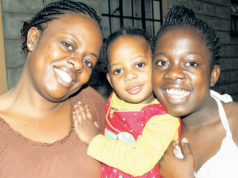 Lucy recalls her first pregnancy with her 13-year-old daughter, Ruth. With little knowledge on the importance of antenatal care, Lucy began her clinic visits when she was four months pregnant, which is considered late. It is recommended that women seek antenatal care as soon as they find out they are pregnant so that they can, among other requirements, begin taking iron and folic acid supplements critical in the first three months of gestation. Thankfully, Lucy’s pregnancy proceeded without a hitch. “I ate anything and everything I wished with little regard for my nutritional needs. On my exact due date, I walked into the hospital and a few hours later, I had my bouncing baby girl. With no complications for both mother and baby, we were discharged two days later,” she recalls. When Lucy fell pregnant with her second child in 2010, she naturally assumed that the pregnancy would be just as seamless as the first one. Married and with a well-paying job that provided a good medical cover, Lucy had little to worry about. “Because I was older and wiser now, I began my antenatal visits as soon as I found out that I was expecting. Aside from the guidance of my doctor, I had access to the internet, where I kept myself well-informed about the progress of my pregnancy,” she says. It was a relatively smooth pregnancy, just like her first one. However, when she was 30 weeks pregnant, Lucy noticed that a liquid she thought was urine was trickling down her legs. Worried, she informed her husband, a medical doctor, who immediately rushed her to hospital. Her doctor informed her that her waters were breaking, meaning that the amniotic sac, which contains the fluid that protects the baby in the womb, had began tearing. This usually happens when the baby is full term and the mother goes into labour. Also Read: What Foods Should a Pregnant Woman Eat? Is Liver Safe? Lucy says that she sensed trouble when the doctor questioned her about the baby’s movements. The doctor informed Lucy that the foetal heartbeat was faint, indicating that the baby was tired. The unexpected news shocked Lucy as she was not ready to welcome her child at that time. “I pleaded with the doctor to delay the surgery for a few minutes to allow my husband to make his way to the hospital, but the doctor declined, saying it could not wait for even a minute. A short while later, I was wheeled into theatre, still reeling from the shock of it all,” she recalls. When she came to several hours later, Lucy went to see her baby, delivered with a birth weight of 1,900 grammes. She was not prepared for what she found in the newborn special unit. “I saw a tiny little thing that I was told was my baby. She was extremely thin, hairy, and was breathing rapidly. She had tubes all over her body. As I looked down at her, I wondered if it really was my child and what on earth I had given birth to,” she recalls. Lucy was neither allowed to touch her baby or breastfeed her. “I was numb from a variety of feelings: shock, disappointment, pity, love, anger, pain, worry… that was not the ending I had envisioned of my pregnancy. It was not the pregnancy outcome I had expected,” she says. During those two days, Lucy would stare at jovial mothers happily holding and nursing their healthy babies and would weep for hours on end. Also Read: Is it Possible for a Short Woman to Have a Natural Birth? “One time, I went to the nurses’ station and complained about one particular new mother who would receive many visitors. I felt bad because she was happy, yet there I was, with an extremely sick baby I spent every minute agonising over whether she would survive. I asked the nurses to stop this mother from receiving any more visitors. Now that I look back, I realise that I did that out of frustration,” she says. Due to her prematurity, most of her daughter’s organs were not fully developed. 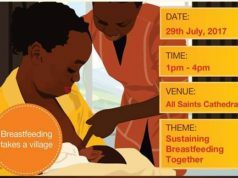 She could not feed on breast milk as she could not digest anything but glucose. She had jaundice and was found to have holes in the heart. She also developed a severe blood infection, which saw her undergo six blood transfusions during her six-week stay in hospital. Several times her veins blocked and caused the blood and medication to flow into her tissues, causing her lifetime scars. Lucy recalls the day she was discharged without her baby. “I felt so sad and empty. 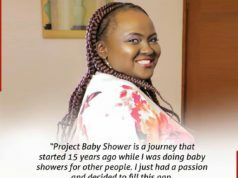 I had done everything right to ensure that I had a healthy pregnancy, yet I was leaving my baby in an incubator, very ill. 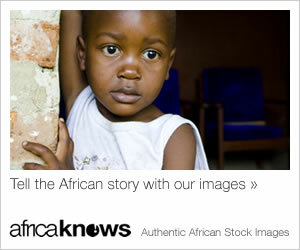 It was a very painful experience,” she says. Also Read: Is There any Harm in Pregnant Women Eating Stones and Other Non-Food Items? Each day, Lucy would report to the hospital at 6am and leave at 10pm. At home, she would endure sleepless nights. “I would hear voices in my head mocking me about leaving my baby in hospital. Why was I sleeping in my bed, yet my daughter was alone, her only companion tubes and machines? What kind of mother was I to leave my sick daughter? What if she woke up and cried for me? Would anyone hear her? Would anyone comfort her? These are some of the thoughts that bombarded my mind all night long,” she says. Lucy would stay awake, counting the minutes to dawn. “I approached my daughter’s bed each morning stealthily, scared that I would not find her. This is because there are days when I would leave the hospital at night and when I returned in the morning, I would find one of the babies missing, a baby whom I knew was not yet ready to be discharged. My heart would be filled with panic, fearing the worst for my baby,” she remembers. Lucy shut people out of her life, only relating with her immediate family. “I knew people were concerned about me and wanted to console me, but I shut them out because I wanted to deal with issues on my own and not have too many people around me,” she says. Lucy was finally able to hold her baby for the first time after a month. “I cannot explain the feeling that overcame me when I held her in my arms and pulled out my breast for her to suckle. I cried like I had never cried before. The moment was surreal,” she explains. Two weeks later, her daughter, Chelsea, was strong enough to be discharged, ending her six-week stay in hospital. The once-sick girl whom her mother feared would not survive is today a healthy, happy three-year-old who has never suffered any major ailment. Lucy spends time sharing her experience with pregnant women and mothers of premature babies. Lucy says she wishes hospitals had a support programme for mothers of premature babies. “The nurses and doctors focus on the baby and do not pay attention to the mother. Mothers feel lost and emotionally abandoned. Medics forget that the mother’s emotional wellbeing is just as important to help her nurture her newborn to good health. They should have counsellors on standby to help mothers cope with the strenuous emotions they go through as they care for their sick babies, worrying if they will die,” she says. The mother also has to deal with issues such as ensuring that older children are well taken care of and that the home continues to run well. Lucy also has to deal with unexpected financial responsibilities. 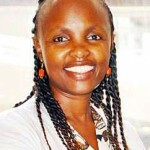 *I originally published this article in The Daily Nation. Mummy Tales is a blog dedicated to empowering its readers on different aspects of maternal and newborn health, as well as various issues surrounding motherhood and women. 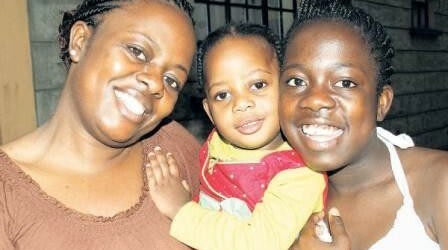 Read more motherhood experiences of Kenyan moms here. The experience is harrowing I have been through it twice and lost 1 and I would like to join Lucy in encouraging other mothers who have premature babies.